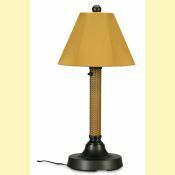 Try our Bahama Weave Mocha Cream Small Patio Table Lamp to add a fashionable styling and light to your outdoor patio table. Each lamp has a bronze, powder-coated aluminum weighted base with a mocha cream PVC wicker lamp body style. These lamps are totally weatherproof and have a two level dimming switch along with a weatherproof grounded cord and plug. The grounded cords are 16 feet in length on this lamp. You can use up to a 60 watt standard light bulb. Every lamp comes with your choice of a decorator weatherproof Sunbrella fabric lamp shade. These portable table lamps stand 30 inches tall. You can use a 60 watt standard light bulb in this lamp. Every lamp shade measures 6 inches by 9.5 inches by 14 inches while the lamp measures 30 inches tall by 14 inches in diameter. Bahama Weave Wicker Patio Lamps are available as table lamps or floor lamps and come in with four different PVC wicker colors. You will love the added touch of elegance that these floor and table lamps will bring to your patio or deck area. They are sturdy and will last for years. Nothing is more practical for lighting up an outdoor area for entertaining your friends after dark. Since they are designed for outdoor use, you will find these lamps are functional and decorative for your porch or deck area. These lamps will be available November 1, 2006. 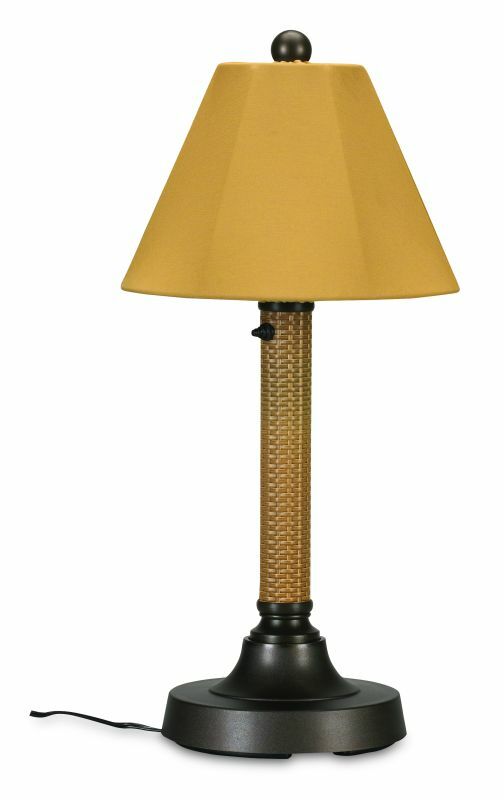 Pre-order your Bahama Weave Lamp today! 16 foot weatherproof grounded cord and plug. SunBrella fabric shade in choice of color. PVC weatherproof wicker body style.